Ah, The Sweet Smell of… Failure?! How can that bee? We’ve just spent the better part of the weekend processing honey. The house smells sweet and clean from honey and beeswax. Unexpectedly, we have a lot of honey. This is honey that was left in the hives so the bees would have something to eat over the winter. The problem is that the bees didn’t make it. We checked the hives a couple of weeks ago and confirmed our worst suspicions; all the hives were dead. They must have died pretty early in the winter, because they left ample stores of honey. At least they didn’t starve. There’s nothing wrong with the honey, so, once we’d cleaned up the hives, and done our limited forensics, we collected up the laden frames for processing. We had very productive bees. Our mild winter appears to be melting into an early spring, and we wanted the hives empty before we have a bunch of grumpy, hungry bears roaming around. The late season honey is very different from our first harvest. The honey from early in the season is light, with a floral aroma. The late season honey is thick and more strongly flavored—made with the robust pollen of Black-eyed Susans and Goldenrod. I can’t decide which I like better. We’re not quite finished processing, but it looks like we’ll end up with just shy of seventy pounds of honey. Add that to the thirty-five pounds we harvested last fall, fifteen pounds from the Pinta hive, and… well, it’s a lot of honey. Today we had to run out to buy another dozen quart canning jars. (Folks at the local grocery wonder out loud what you’re canning in March. It’s early, even for maple syrup.) The new quart jars, along with every jar and container in the house brings this batch to about 27 quarts. It makes for a bittersweet failure. We’d rather have the bees. We’ve checked with the experts and the most likely explanation is that our bees succumbed to varoa mites (or to the viruses that the mites carry.) There was some evidence of mite activity in the two smaller hives. Our aggressive hive, Santa Maria, was not so clear a case. It could have been the weather. This winter’s warm/cold oscillations were very hard on local bees. We’re not the only ones who have had losses. Even experienced beekeepers are cursing this winter. It seemed mild, except (quite abruptly) when it wasn’t. 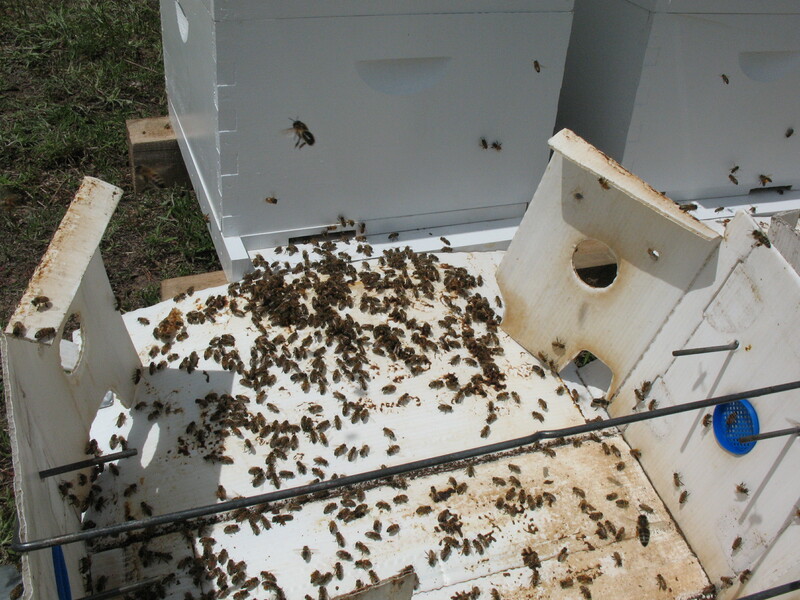 We have cleaned up the hive boxes, and set them ready for spring–we have new bees on order. I’ve also ordered a well-recommended book on natural beekeeping–and I attended a day-long class on advanced beekeeping techniques. I feel almost ready to try again. We’ll monitor mite levels closely. We’ll do mid-season splits (dividing colonies in half, and “forcing” new queens.) Splitting not only increases the number of hives, it also interrupts the varoa breeding cycles. 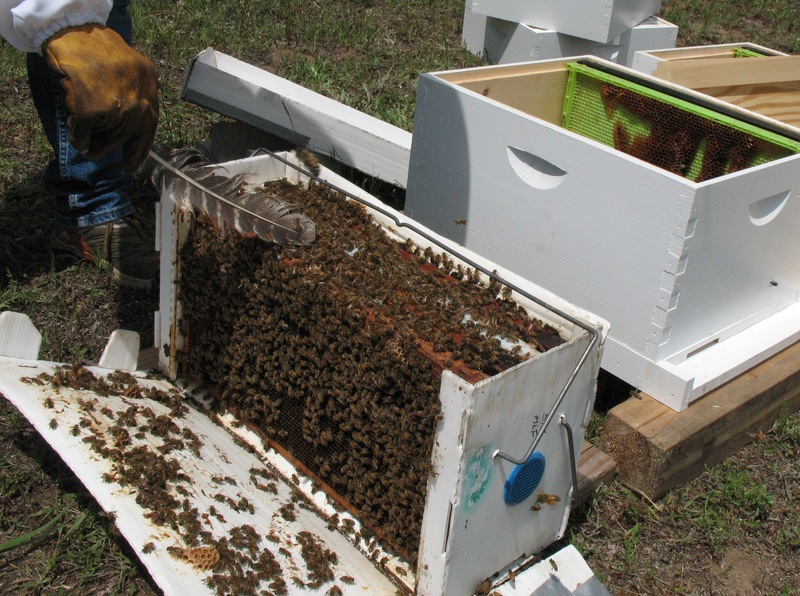 And, we’ll investigate and experiment with natural methods of hive treatment. Bees’ combs are amazing structures. Overall, we can’t complain. The retail value of the honey we harvested has covered our initial investments in bees and equipment. It makes good sense to try again. 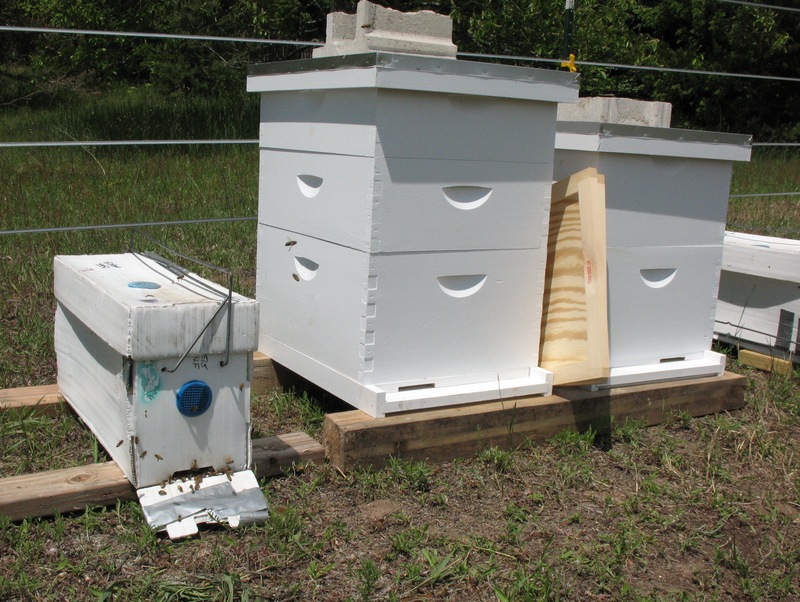 We plan to start with three hives, and split to six, mid-summer. At the end of the season we can assess the hives’ strengths, and either go into the winter with six, or recombine some for larger, stronger hives for next winter. 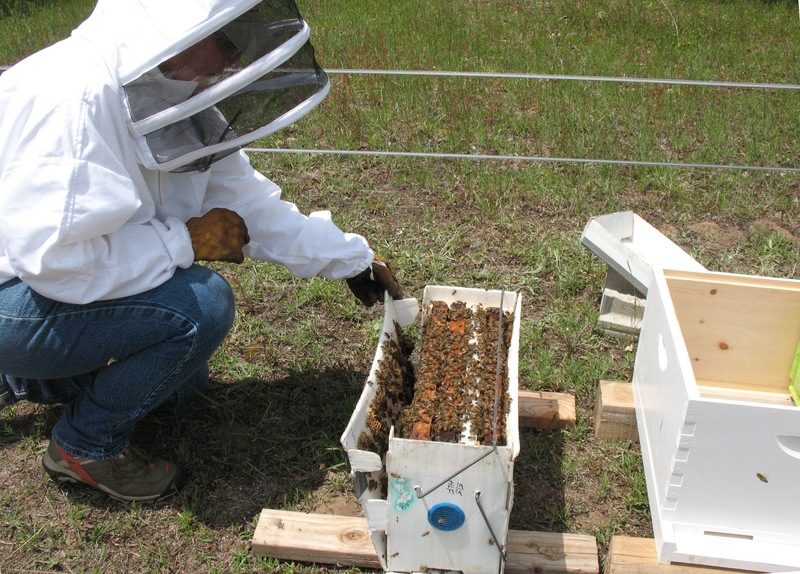 Unfortunately, the new normal in beekeeping is to expect thirty percent losses–and that’s when you do everything right. We’ll have to be a lot better about minding our bees. Bee transport next to new home. Opening up the “nuc” box. Stragglers, joining the rest in their new home.